Contemporary Quilt Art from the International Quilt Festival Collection. For more than three decades, Karey Bresenhan and Nancy O’Bryant Puentes have been purchasing studio art quilts for their Quilts, Inc. corporate collection, mostly from exhibitions at the Houston international Quilt Festival. Founded by Bresenhan in 1974, the Festival quickly became an international destination for quilters from around the world. For the first time ever, part of this collection has been assembled into a nationally touring exhibition. Dr. Sandra Sider, Curator for the Texas Quilt Museum, selected the twenty-five quilts presented here, which date from 1994 to 2008. The artists range from several of the most famous names in contemporary quilt art to emerging artists at the time of purchase whose innovative work caught the collector’s attentions. Themes and styles in this exhibition include narration, color abstraction, landscapes, the cosmos and homage to antique quilts. As a young girl, I loved creating and making things. Throughout the years this love has been expressed in oil painting, woodworking, sewing, and quilting. Designing quilts and playing with fabric continue to be a passion for me. There is a satisfaction in coming up with new designs and simple techniques. The focus of my work is traditional quilts with a new spin. For me, it is about the journey and seeing what I am going to create next; it is the mystery of planning the next quilt that keeps me passionate about designing and creating quilts. Located on third floor, in main hallway and Gallery VI. Star motifs, images, patterns have existed since the beginning of time. People have been fascinated by their shape looking from earth as well as the expanse of space and imagination they can represent. Stars have been used for quilt patterns by quilters of every ethnic origin. The Dakota Indians use the star almost exclusively in their quilts. 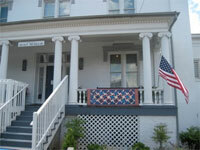 The Virginia Quilt Museum has many quilts with stars. This exhibit consists of quilts using the star pattern starting with the 1800s. There are stars that are intricate to piece such as the Star of Bethlehem or Lone Star. Stars that are in a block settings and stars that are set on point.